Another overplotted Star Wars fable. 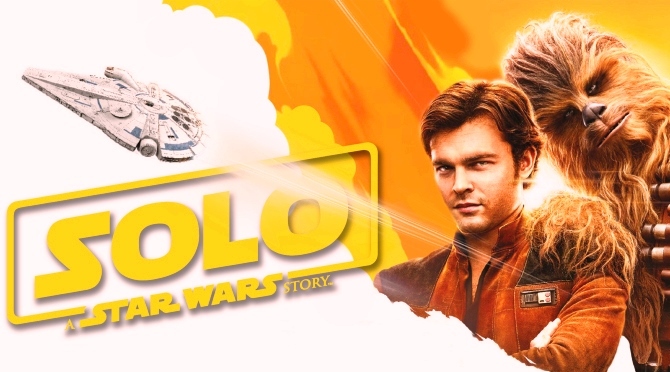 Solo: A Star Wars Story is also weighed down by the impossible task of making actor Alden Ehrenreich into a plausible young Hans Solo portrayal, which is not pulled off, yet Ehrenreich does have a few spiffy moments. However, he’s got nothing on the laconic, manipulative and dodgy Harrison Ford, who was a real do-it-himself badass. The director here is Ron Howard (whose best film is “Apollo 13,” then after that, all my other Ronnie favorites are his non-special effects movies), who replaced the fired team of Phil Lord and Christopher Miller, and Howard disposes tongue in cheek humor and hijinks for the jumpy and gritty kind of action filmed in coats of charcoal dust. Note to Ronny (and to every other sci-fi director in Hollywood): You are not Ridley Scott, don’t try to be. To not lose us, something major has to happen every seven minutes or so, as if the entire studio head behind the movie is afraid they’re gonna lose us if they don’t pack in our money’s worth. What’s packed in is a frenetic checklist of “Star Wars” iconography that’s enough for a six-part miniseries. The last few “Star Wars” movies has also been giving us that trope of the good guys disguising themselves in imperial trooper outfits in order to infiltrate the bad guys’ headquarters. Hasn’t the Dark Side in any of these movies caught on that their opponents are dressing up like them in order to break in and mess up their plans? Ehrenreich has that impressionable baby face and gosh darn demeanor to him. He was excellent as the daffy matinee idol in the Coen Brothers’ farce “Hail, Caesar!” where he could have fit into any deliciously corny Roy Rogers western. Ehrenreich’s got his charms, he’s got a sweetness that would belong in a bunch of other genres that has romantic labeling to it. He’s a nice dude. Yet another problem with the way the character is written in this “Star Wars” entry is that he’s always bending his ways in order to build alliances. Ford had the gravitas of a rogue player, of one who could outsmart any sleaze adversary in the galaxy, one who would shoot and ask questions later. In order for me to accept Ehrenreich as Han Solo, I would have to flex my standards of what in my mind I think works. I cannot do that. 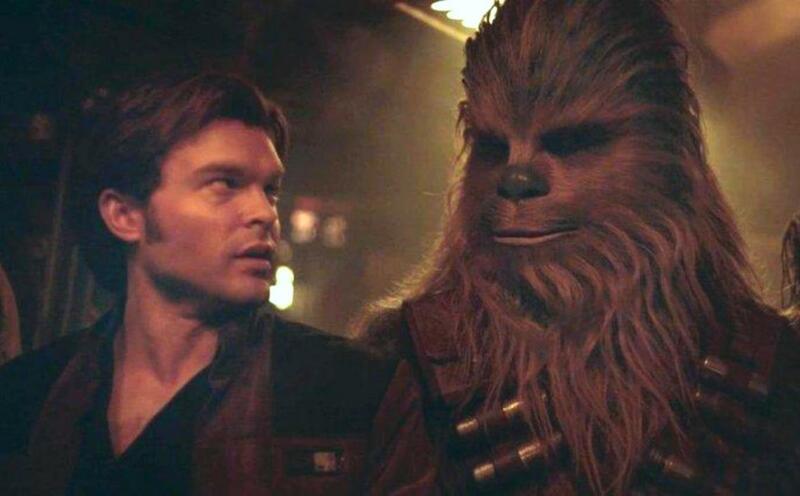 “Solo” provides a tease that awesome things can still happen in a “Star Wars” movie down the line, but the people making these movies need to stop overthinking their plots and also hire a badass dude we can believe in. True, finding the new Harrison Ford is a tough act to come by. Woody Harrelson gives a reliably decent performance as a shady smuggler, Emilia Clarke makes me believe she could have starred in a Michael Powell / Emeric Pressburger film from the 1940’s as the girl Solo has long lost, and Donald Glover gives the best impersonation of an iconic character as Lando Calrissian. Wait, also… who knew Chewbacca was a cannibal? (Although, yet again, we never see him eat anything. While on the subject of eating, what the hell does that outer space predator that’s like Mother Godzilla floating in space eat on a regular basis so it doesn’t starve while out in the coldness of, uh, space? Flotsam?) Also, Paul Bettany and Thandie Newton are also notable players. Film Cousins: “Star Wars” (1977); “Star Wars Episode XII: The Force Awakens” (2015); “Rogue One” (2016); “Star Wars Episode XIII: The Last Jedi” (2017).